Relocate! Magazine | Bringing You Destination Options for Relocation - Relocate! 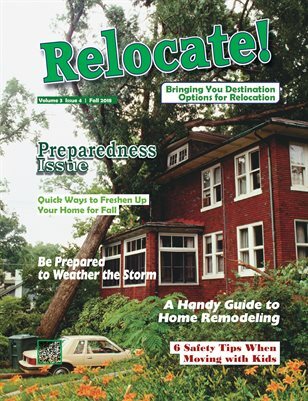 Magazine--Bringing You Destination Options for Relocation. ​Hurricane season is in full swing, running from June through November. Unfortunately, no one can stop a tropical storm or hurricane from happening and both types of weather events are increasingly impacting larger portions of the U.S. However, there are steps you can take that will help you weather a storm and better ensure the safety of your family. Protect your valuables and family mementos by storing them in a safety deposit box, fire– and water–proof safe or moving them to higher ground where they are less likely to incur damage. Be sure to read our Road Trippin' Issue! In This Issue: Product Review: Just My Color radian® rXT All-in-One Convertible Car Seat; Relocating? 10 Tips for Busy Baby Boomers; Car Shopping? Get Smart About Warranties and Service Contracts; Buying Tires for Your Car? What to Consider; 9 Things All Drivers Need to Know About Their Tires; A Pre-road Trip Checklist to Avoid Towing Trauma; The Travel Warrior's Nutrition Guide: 5 Easy Steps to Be Healthy on the Go; Are You Prepared for Wet Roads? ​Hitting the road this summer and want to do something good for the world along the way? Consider using your summer road trip as an opportunity to give back to the communities you visit. For some inspiration, check out these great ways Americans are rethinking vacations to include a touch of philanthropy. All those miles you log on the road can be for a good cause, if you look in the right places. Check out organizations and brands hosting fun fundraising or volunteer events on the road. For example, “MINI Takes the States,” a biannual rally for MINI Cooper owners, gives participants an opportunity to explore America’s beauty while raising money for Feeding America, the nation’s largest hunger relief organization dedicated to fighting domestic hunger through a network of food banks. In 2016, rally participants raised enough money to provide 1,301,969 meals to families in need, and this year’s goal is over 2 million meals. Occurring July 14 – 22 this year, MINI Takes the States will see owners kick off in either Orlando, Fla. or Portland, Ore. and converge in Colorado, passing through some of America’s most interesting and beautiful sites and cities. A portion of each registration fee is donated to Feeding America and participants are encouraged to start fundraising pages online and spread the word to friends and family to contribute to the cause. Each dollar raised will provide at least 10 meals to people in the U.S. struggling with hunger. To learn more, visit MINITakesTheStates.com or follow the conversation at #DriveForMore. America’s parks need your help, particularly their hiking trails. Volunteer opportunities abound for those who wish to combine a road trip with trail stewardship. After traveling to your favorite park, join a volunteer crew to build or maintain a trail, increasing accessibility to America’s most beautiful natural wonders. Or, be someone who brakes for animals -- animal volunteer opportunities that is. Many animal sanctuaries welcome vacationing volunteers to provide extra hands. From socializing dogs to feeding horses, certain opportunities even include lodging to those giving their time. By giving back to the places you visit, you can take the concept of the ultimate summer road trip to new heights. ​It’s that time of year again when unwanted weather patterns like severe thunderstorms, rainstorms and tornadoes can wreak havoc on homes and businesses. While certain areas of the country are more apt to face tornadoes, virtually everyone is at risk for heavy rain, winds and hail, which can cause flooding, power outages and structural damage. Whether you’re in the Midwest, the Southwest, the Great Plains or any other part of the country, it’s important to be prepared for the upcoming storm season. Have a plan. Assign everyone in your house a defined role. Let someone be responsible for gathering your pets; someone else, medication and important, irreplaceable documents. Identify areas of your home that are most secure so you can take cover. And while having a plan is a great first step, practicing it is even more important. Make electronic copies of all important documents. Take pictures of your home and its contents to use with insurance providers after damage has occurred. Update your contact list. Make sure it includes critical phone numbers such as insurance providers, emergency response agencies and professional restoration companies that can immediately assist with damage. Also, be sure to have multiple ways to contact your friends and family to tell them where you are and what you need. Have back-up chargers available in the event you lose power. Know how to turn off your utilities. In some cases, you need to be prepared to turn off water, gas and electric service if asked to evacuate or if flooding is imminent. Take steps to keep your home protected. If water enters your home, you can help limit water damage to your contents by lifting drapes off the carpet, looping them through a coat hanger and placing the hanger on the drapery rod. Outside your home, keep mulch away from the foundation to minimize the risk of water collecting near the building and possibly leaking into the basement. Safety first. Floodwater may be electrically charged by downed power lines. If you see any fallen power lines, call your utility company immediately. Do not assume someone else has already contacted them. Once authorities give you the greenlight to reenter your neighborhood and home, make sure you have the proper gear to do so. Use waterproof boots and gloves to protect your skin from unpleasant or dangerous pollutants in the water. Check the structure. If your home's structure or foundation appears unstable, do not attempt to go inside. Immediately call for professional help and get a thorough assessment of the damage. Water damage after heavy rains can cause walls, ceilings and floors to swell, decay or collapse. Take inventory and contact your insurance agent. Photograph and document all damages to your home and belongings to support any future insurance claims. As soon as possible after a storm, contact your insurance company or representative to check your coverage and start the claims process. Limit damage. Rainwater and floodwater can damage your home’s contents and structure, and create ideal conditions for mold growth within a matter of hours. However, because floodwater is often contaminated, extra care should be used when entering the property and removing damaged items. Work with a qualified professional to prevent additional damage. d. Make sure they have the proper permits and licenses to do the needed work. Understanding what to do after severe weather has passed can help you get back on your feet much quicker. If you don't know where to start, call the experts at ServiceMaster Restore to guide you through the restoration process. Editor's Note: Sad to say, this is one thing we don't think of when it comes to preparation. However, in watching the news and seeing the reality of our nation's children getting gunned down in their schools, we are past the time to prepare. Let's stop thinking, "This can't happen to us," and prepare for the worst, before it's too late at your child's school. Active shooter incidents are rare. You are 700 times more likely to die in a car crash, for example, than from an active shooter event, according to the National Safety Council. However, these terrifying events are on the rise. Experts say that being prepared can save lives. Learn emergency notification systems and distinctive alarms used in places you frequent. Identify two possible escape routes wherever you are. Run: Always the first choice; get out and take others with you. Fight: The last resort; improvise weapons and work alone or with others to disarm the shooter.